Today, a group hike, and eight of us travel by car to the peninsula of Caravelle, spectacular trails, a lighthouse, and splendid views. 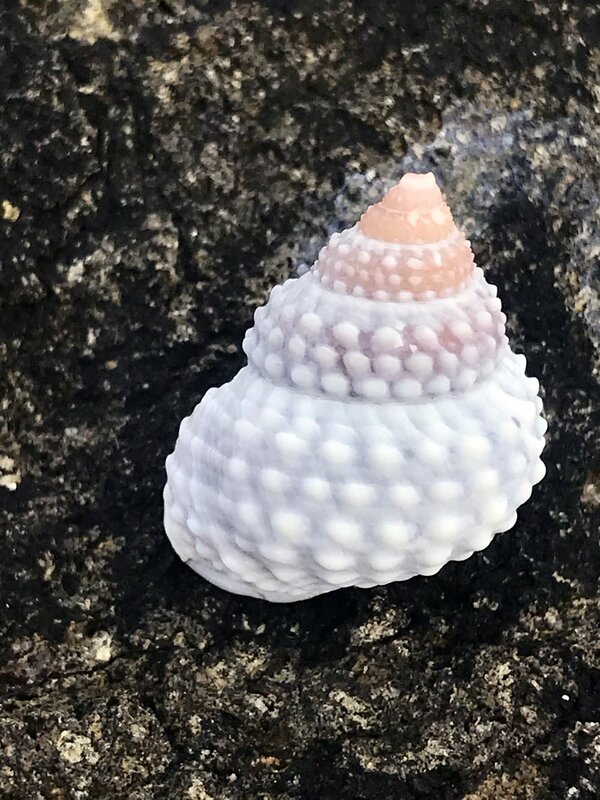 And, yes, hot sun, a fantastic breezes, wild surf thrashing on ancient rocks, moist, hot shade under a canopy of trees, pleasant coves, invigorating scent of fresh vegetation and on one the rocky point a slathering of tiny whelks, and this bright one that captures my eye. Of course, we are all taking so many pictures of the landscape, the sea, the sky, the clouds over green hills, the Atlantic magnificence. But the whelk is my singular, private moment. It noticed me and called my name. It's the picture I want to take home and consider. Perhaps what calls to my unconscious is the power of attachment. How securely it has found its place on the windswept rock. I will let the snail be an image guide in the collage I began in the late afternoon. And so, we walk happy, dry and hot, suddenly rain, and we are cooler. We walk until we are too tired to walk more, so I am very satisfied.